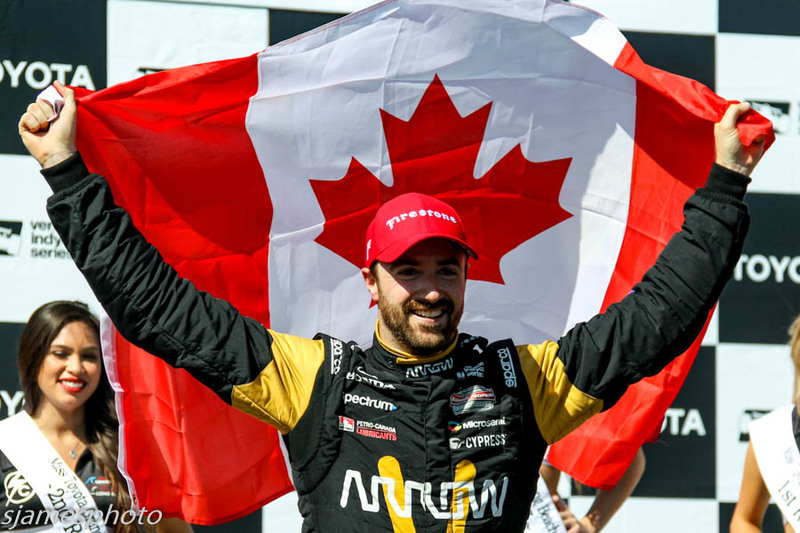 For months during the off season we watched as James Hinchcliffe, who relocated to California for the duration, battled to win a big trophy on "Dancing with the Stars". Though he won the popular vote, he went home in second place, and empty handed. Today on the streets of Long Beach, in front of a group of over 50 friends and family, including his extended DWTS "family", in a battle more suited to his skill set, he righted that wrong and hoisted a bigger, better trophy, winning the historic Grand Prix of Long Beach; only the 2nd Canadian to do so. Pole-sitter Helio Castroneves seemed to be asleep at the wheel off the start, getting swallowed up by his fellow competitors, losing 6 positions before the first turn. Still on the first lap, from turn 1 all the way to 4, coming into the fountain, Charlie Kimball and Will Power battled side by side, bumping and banging, until it all went wrong. With Power on the inside, and Kimball not giving any room, the two drivers made contact, sending them both careening across the track into the outside wall. Both were able to drive around to pitlane, with Power only suffering cosmetic damage. Kimball’s car however suffered the lion’s share of the damage, and he would retire from the race. Further back in the field someone’s bodywork got into Bourdais, sending him to the pits to repair this rear wing assembly. While Conor Daly spun on his own on the start, and tapped the wall damaging his rear wing. After a quick clean up, Dixon, who took over the lead on the start, leads the field to the green on Lap 5, followed by Hinchcliffe and Hunter-Reay. 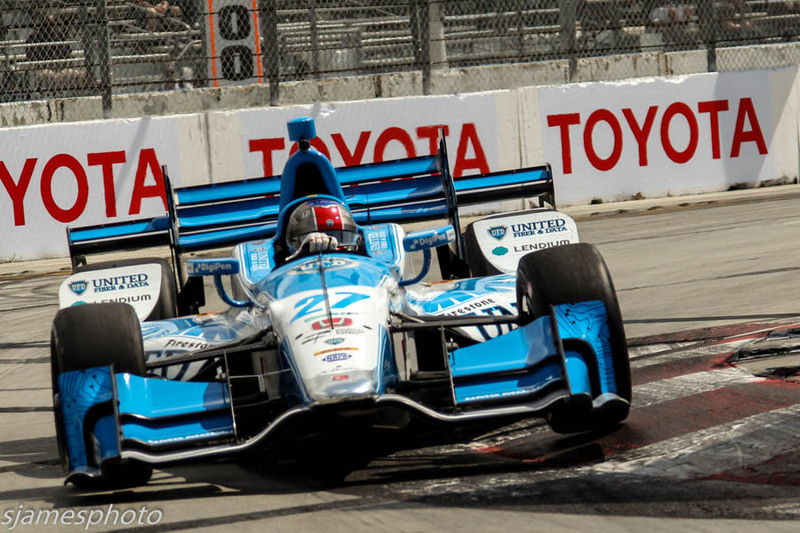 Of note: Pagenaud was up 9 positions by lap 6. Lap 14: Marco Andretti had a mechanical issue mid-battle with Mikhail Aleshin, his car shooting sharply offline, then coming back on track, but way off pace. He would limp around for the remainder of the lap, before pulling off into the run off. Day done. This turns out to be foreshadowing for what would be a dismal day for Andretti Autosport. Lap 16: Dixon pitted (still not sure why as they looked to be on pace to run a 2 stop race) but none of the other leaders pit, so Hunter-Reay takes over the lead. Lap 28 sees Hinchcliffe and Rossi drop into the pits, while Hunter-Reay stays out the extra lap, pitting on lap 29, and getting out ahead of Hinchcliffe. This returns the race lead to Dixon. Lap 41, leader Dixon comes in for his 2nd of 3 stops manages to stay within striking distance of the “2 stoppers” stalking them from 5th position. Lap 60 sees a good battle between Newgarden and Dixon, just prior to Newgarden diving down pitlane for his final stop. Castroneves also pits on this lap from 7th spot, but his luck runs out again as race control slaps him with a drive thru penalty for pit speed violation. He would finish 9th. A lap later Dixon would come in for his 3rd and final stop. This turns out to be a timely decision as just as Dixon was exiting the pits, Alexander Rossi came to a stop on track, bringing out the full course caution. This bunches the field back up, with all stops having been made, theoretically setting up for an epic battle to the finish. After what seemed like an eternity, (we later learn that race control sent the sweepers out to clean up the racing line a bit for the final stint) the race restarts on Lap 69, with Hinchcliffe easily getting the jump on the field and pulling out to a nice 1.9 second lead on the disadvantaged Hunter-Reay, who was running on blacks at the time, while the rest of the lead pack was running reds. 9 to go: Kanaan and Aleshin go wheel to wheel, with Kanaan getting by, but ultimately losing the battle when his left rear tire was cut down by a piece of Aleshin’s body work. 6 to go: The remaining Andretti Autosports drivers are dropping like flies! Sato slows and pulls off at the end of the front straight , followed shortly by Ryan Hunter-Reay who’s car mysteriously comes to a stop between 7 & 8, leading to a camera shot of a very despondent looking Michael Andretti. 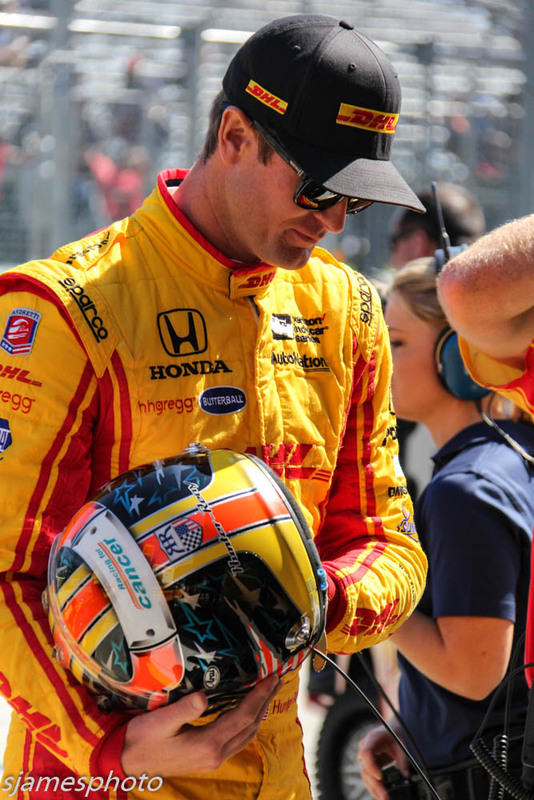 3 to Go: The race restarts with Hinchcliffe leading the way, and nary a fight from 2nd place Sebastien Bourdais. He would later admit he had some handling issues, and chose not to engage in a battle, but happily hang on for 2nd place. It was a flurry of push to pass behind the leader, with everyone battling for position, including Hildebrand and Aleshin, who ended up having a nasty dust up, when Aleshin moved ever so slightly to protect his position, leading to Hildebrand, who clearly didn’t expect the move, driving over the left rear of Aleshin, and shooting off into the run-off. Aleshin would be penalized for blocking, and lose one spot, to finish 12th behind Hildebrand. But no one had anything for Hinchcliffe, who cruised to victory, capturing his first Long Beach win, the 5th win of his storied career. An almost repeat by Bourdais, who again ended up driving from the back (after the first lap incident) to battling for the win. With his 2nd place finish, he remains in top spot in the Championship standings. Of Note: His teammate, rookie Ed Jones, battled to a 6th Place finish, keeping Dale Coyne Racing in the lead for the team championship. 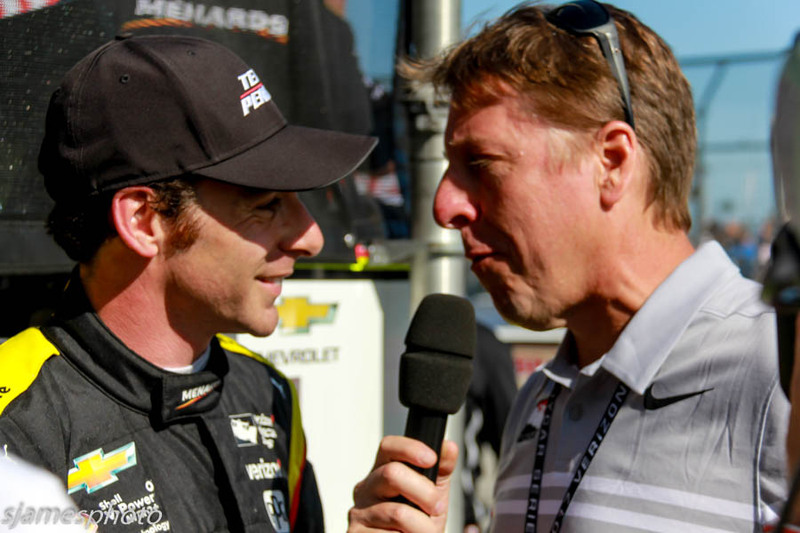 Reigning defending champion Simon Pagenaud, who had an uncharacteristic showing during qualifying, putting him at the back of the pack to start the race, battled from the back twice (he had a cut tire early in the race) to finish 5th, and jump to 3rd in the standings. 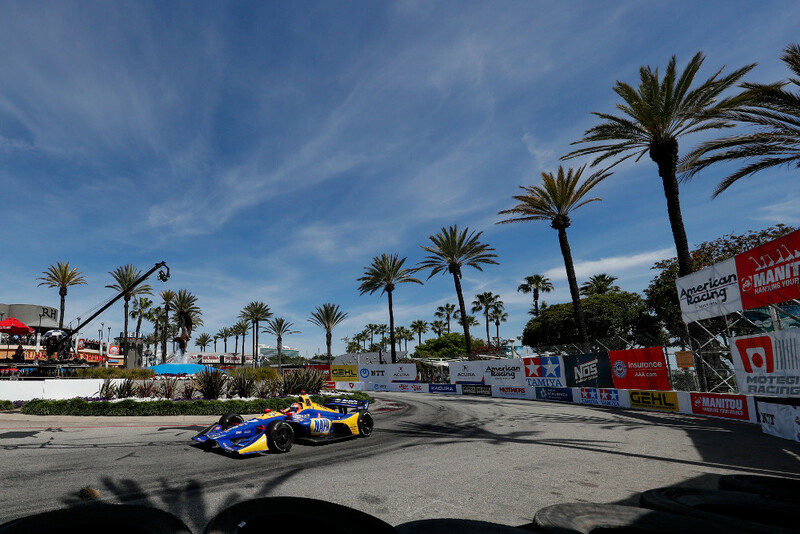 All four Andretti Cars, who all could have been contenders for the podium at one point in the race, suffered mechanical woes, with the engines shutting down, leading to 4 dnfs. The series takes a break for Easter, then reconvenes on April 23rd at Barber Motorsports Park for the Grand Prix of Alabama.